Ato Zodi, Operations Manager; very experienced in working in coffee around Ethiopia. Just when the road can’t get any worse, a small bottle-shaped sign nearly hidden in the greenery tells us it’s getting narrower. As we lurch over grey and rusty gravel we can look to our right, over scrubby greenery, scrawny cows, and round huts, and see spread below us the majestic green valley of Torre. And then, we enter the field, a broad expanse full of acacia trees, bright green grass, and tiny bushes like bonsai trees, dotted with colorful figures of people staring, carrying burdens, herding goats, all under the benevolent gaze of Lato Samalo mountain. Muddy tire tracks cross the field in several wavy ribbons. Children shout in astonished joy, "Ferengi! Ferengi!" (Foreigner!) and run alongside the vehicles, bare feet pumping against the green green grass. Pride Mill sprawls at the base of Mount Lato Samalo, around 7,070 feet elevation, employing 200 laborers for receiving, washing, sorting, drying, and preparing coffees for transport. While located in the Borena Zone, it is about 20 kilometers from Chelelektu village. Technically classified as Gelana Abaya district, it borders Kochere district (the beautiful landmark of Reko Mountain is visible just beyond Lato Samalo) and lies within the coffee area we all know as Yirgacheffe. We have visited Pride Mil multiple times in the last couple years, each time marveling at the beauty of the area, the joy and reception in the laborers and management, and the hard work that makes Pride Mill so special. This year we are implementing lots of new projects at Pride Mill, and have many more planned for 2018. 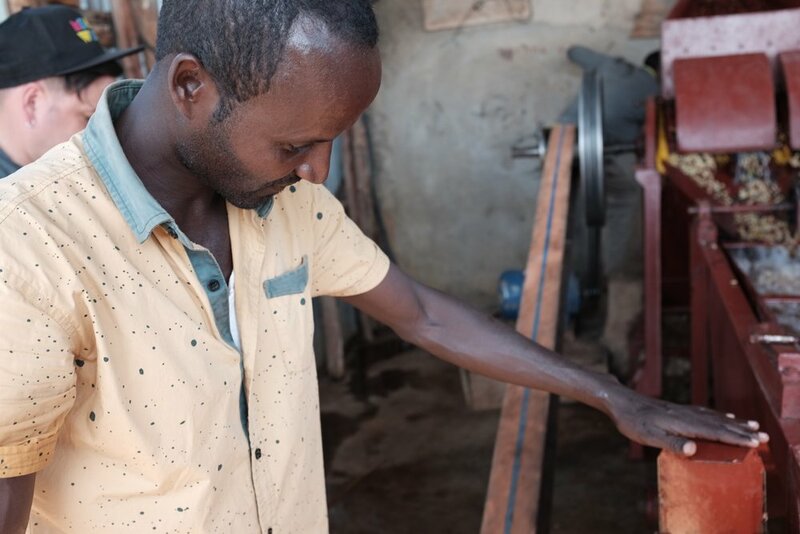 These projects include experimenting with using floating tanks to remove low-density cherries before processing (we have seen stunning results with this practice, which is regularly used in other countries but very rarely in Ethiopia), building new drying tables that replace the traditional bamboo mesh, which offers significant mold risk, with plastic, and training employees in consistent protocols for more reliable, repeatable quality lots. The team at Pride Mill, managed by an experienced coffee professional with startling blue eyes named Zodi, has welcomed every bit of input we can bring and communicated that they are excited to have the chance to do progressive work in Ethiopian coffee processing and to produce better and better coffee. 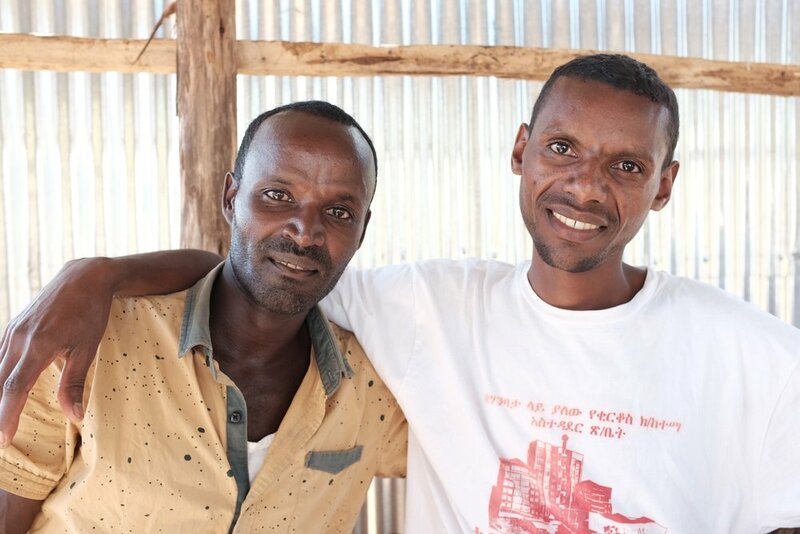 People like Zodi, Desale (assistant manager), Teriku (the engineer at Pride), and Tesfaye (accountant for Pride), and the beautiful community surrounding them and laboring every day during the harvest season in the harsh sun to produce masterpieces for us to share with roasters around the world: they inspire us to labor harder than ever to ensure that everybody gets what they need, that the coffee value chain really is valuable, and that these coffees grow to their full potential.